This year we planted four basil plants. If you have ever had basil, you know that it can really produce! The task, if you are up to it, is to figure out how to use this wonderful abundance before it goes bad on the plant or wilts away on your counter. If you are new to basil, you should know that it is a plant that the more it is picked, the greater the bounty will be. But if you do not pick it, the leaves will die off or the plant will flower and no longer produce which would be such a waste of such wonderful flavors! One of my favorite ways to use basil (besides in Tomato Mozzarella Bread!) is to pick a bunch and whip up some pesto! Pesto is one of those kitchen staples that is fairly easy to make, can be customized to suit your tastes, and can be used in a wide variety of ways. We recently had pesto tossed in vermicelli pasta with chicken breasts and roasted cherry tomatoes. Talk about yum! In my book, food that is good, good for you, and fresh from the garden is a winner indeed! I hope you enjoy this as much as we do! 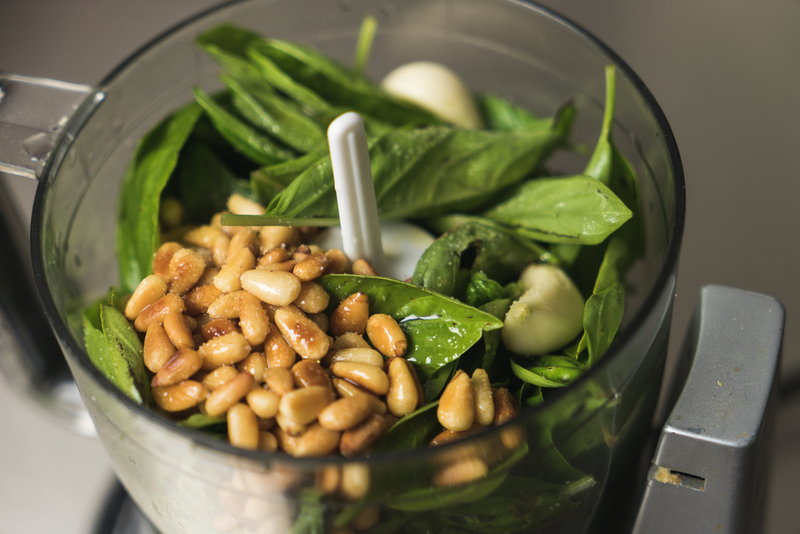 In a food processor, place the basil, pine nuts, 3 of the garlic cloves, 1/2 cup of the oil and salt. Process the mx, stopping to scrape down sides and check seasoning and texture, adding any additional salt as needed. Pour additional 1/4 cup oil in and process until combined. Scrape down sides and add Parmesan. Process until combined and add pepper to taste. If desired add additional oil, salt and pepper. To toast the pine nuts, put the nuts in a skillet on low heat. Toast util golden and remove. Allow the nuts to fully cool as this will affect the consistency of the pesto if you do not. This give the pesto amazing flavor so is a step you should really not skip! Pesto does oxidize and will brown the longer it is exposed to air, so this is a recipe that should be made the day you plan to use it. It can be made in advance and stored in the refrigerator with plastic wrap covering the pesto itself then a lid, but will need to be stirred and may still have slight discoloration (thought this does not impact the taste). There you have it, pronto pesto! Pesto is best used within a day or two of preparing so go ahead and plan a get together with some fine pasta with pesto, crusty bread with pesto spread or pesto pizza night and get eating!